The students have been protesting against sky-high fees, and are demanding free treatment for poor patients and improved facilities in the medical college and hospital. 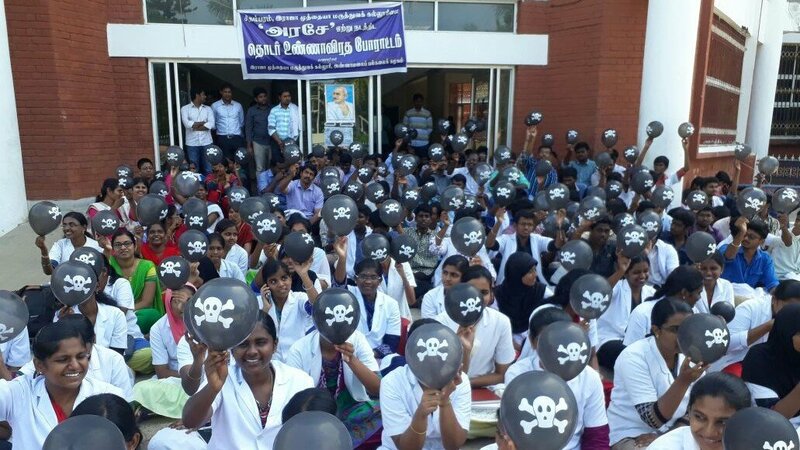 Students of Raja Muthiah Medical College, affiliated to Annamalai University in Tamil Nadu, are demanding that the state government take over the college and hospital. A relay hunger strike by the protesting students entered its 12th day on October 3 while an indefinite strike has been going on for the past 35 days. In 2013, the Tamil Nadu government took over the administrative control of Annamalai University, in the wake of financial and administrative irregularities. But even after Annamalai became a state university, Raja Muthiah Medical College in Chidambaram continued to function under self-financing mode. As a result, the fees charged by the college and hospital are much higher than that of the other 22 government medical colleges across Tamil Nadu. Since August 29, students have been protesting against the sky-high fees, even as the administration has served show cause notices on the students. MBBS students in the college pay Rs. 5.54 lakh per year, whereas government-run colleges charge only Rs. 13,600 per year. For MDMS, while the fee fixed by the government is Rs. 31,325 per year, students here pay Rs. 9.8 lakh per year. The students are also demanding free treatment for poor patients and improved facilities in both the medical college and hospital. Speaking to Newsclick, Kanagaraj, a medical student from Cuddalore, questioned why the government was blind to the plight of the protesting students. “The main reason students are protesting is to achieve justice for poor patients and students,” he said. He said the students had also launched a social media campaign to garner more public support. The website of Rajah Muthiah Medical College states that free treatment and free diet is provided to all patients, but a post-graduate student of the college, speaking anonymously, said the hospital collected payment for every small treatment it provided. He said the charges were so high that Rs. 500 was collected even for blood transfusion. So far, the protesting students have submitted petitions to the Chief Minister, Governor, Deputy Chief Minister, Health secretary and Directorate of Medical Education of the state, but are still waiting for their responses.